This gorgeous little cardigan is knitted in one from the top down. It`s a really simple way of knitting and I thoroughly recommend it if you have never done it before, especially as there is no sewing up to do! 4 (5,5,6) balls of Swaddle in MC (colour shown Gooseberry Fool). 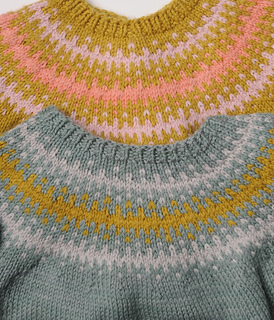 The blue version (shown in Sugared Almond) is short sleeved (it is not quite finished in the photo!). You will need 1 less ball of the MC for each size if you are doing this. Optional: 3mm amd 3.25mm double pointed needles for working the sleeves in the round.